The Maps and Cartography section contains two kind of documents: original maps of Jerusalem reproduced here as a tool for researchers, and links to existing sets of Jerusalem maps—both historical and contemporary. Riwaq’s Jerusalem Maps: The current stock that opens the collection contains five maps based on a ten-year survey of the old city undertaken by Riwaq: The Centre for Architectural Conservation. It contains a historical map identifying the evolution of sites according to the historic era (Roman, Byzantine, Umayyad, Fatimid, Ottoman, etc. 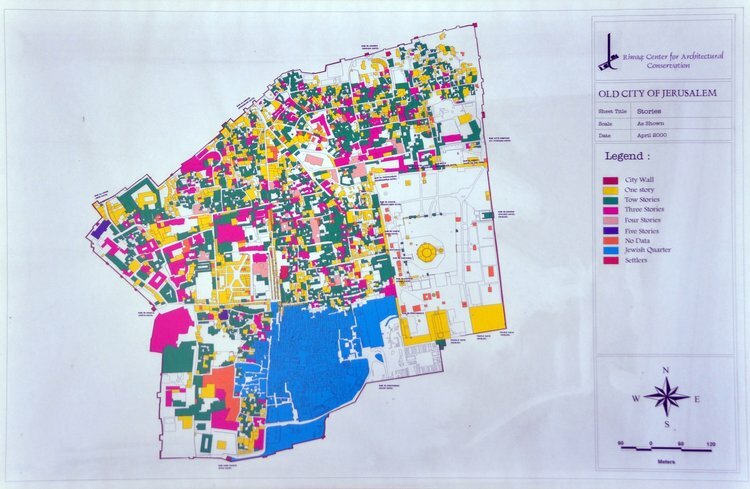 ), as well as markers identifying the condition, nature, size of buildings and residency in the walled city. Those maps can be downloaded and used by researchers provided source reference is identified. (Copyright Riwaq: Bireh, Palestine)—Higher resolution images are available from the Centre directly.